i think any one concerned with the dB reading is going to be using the STR version and a single exit. We will work on it..
1. I noticed the STR version of the midpipe does not expand as big as the Urge version. Is this because it does not have sound baffling? Any pros and cons given this design permutation? 2. Do you have dyno numbers of the STR version to compare with stock, test pipe, and Urge version midpipe? 3. Can we get a picture of the STR midpipe side-by-side with the stock midpipe so we can interpret whether the STR rule is fulfilled? You guys are doing some awesome work here! Tne s2k community definitely appreciates it! Let's see some videos of this in action! 1. Yes it is the reason why we could not fit sound baffling. The reason why it doesn't expand as much is that the cone has to be much longer to meet the STR rules to be with in 6" of the OEM cat. We brought it with in 5". If the STR was the same width it would contact the body. 2. I don have a dyno chart, I can see if Gernby can dig one up. But it does make the same power. Ill see if he can do some back to backs with each pipe. He made a few STRs in his original run and they did make the same power. 3. We can work on that picture as well. Gernby has plenty of videos from his original run. We will find some links.. The dyno results of this pipe have always been quite impressive. I do not see a cat in the STR pipe. Where is it? The STR rules try to define what a "cat" is- is it the pipe containing the cat, the catalytic material, or the expansion chambers containing the cat. That, to me, would be where the cat pipe tapers into a standard diameter (within 6" of the OEM O2 bung location would be a good rule of thumb). People discussed building a 3' long expansion chamber with the cat at the end but that isn't what the rule intends to allow. The intention is to allow moving the core of the cat downstream no more than 6". This clarification pretty explicitly spells out that as long as the expansion chamber begins within (from the rule book) "within 6” (152.4 mm) of the original unit." the catalyst medium can be located anywhere within the assembly. The Cat is on the 2nd part back end of the chamber. The STR and URGE spec share the same back end. Only the front part is different to meet STR rules. The cat is in the section behind the rear tie bar. 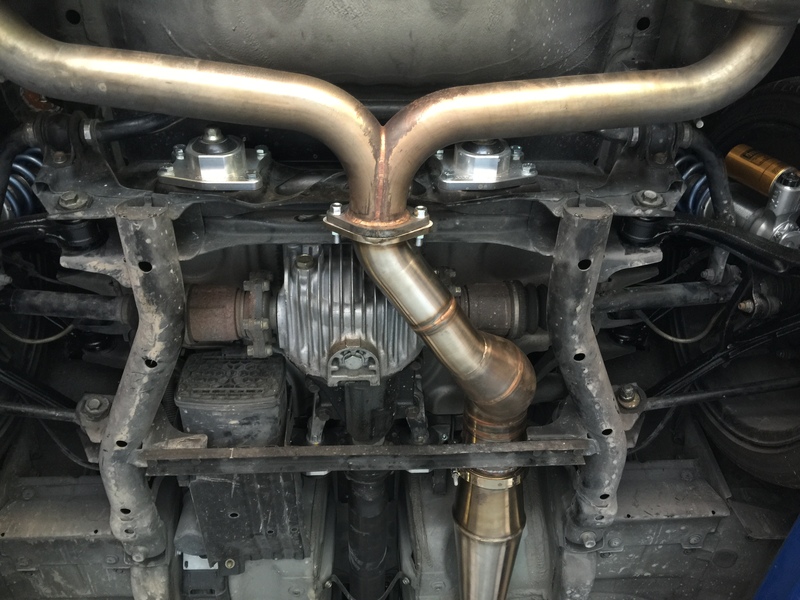 There is no hanger on the Mid Pipe, it is much lighter than the OEM cat and mid section. Gernby never had a hanger on his original 50 units he sold. So we didnt either.